What Does An Urban Small Stream Flood Advisory Flood Look Like? 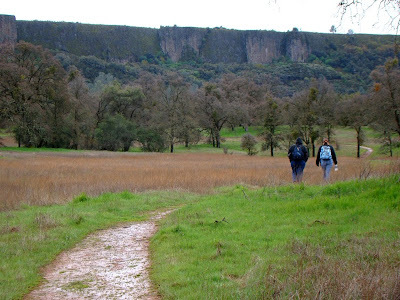 Dry Creek has its headwaters in the foothills of the Sierra Nevada north of Modesto Reservoir. It flows southwest through the farmlands into the town of Modesto, where it joins the Tuolumne River. 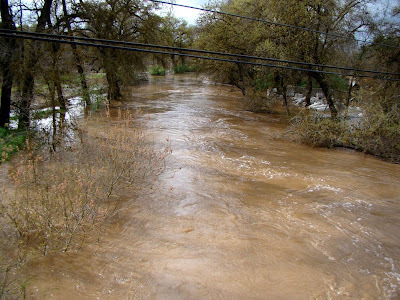 Dry Creek, despite its name, is rarely dry. Prior to agricultural development in the last century it was indeed dry for much of the year, but since the irrigation began, seepage keeps water in the creek for most of the year. But rarely is there more than a few cubic feet per second. Dry Creek is an unregulated drainage, meaning there are no dams or other measures to control floodwaters. It normally isn't a problem, but every couple of years events conspire to cause problems. This week was one of those weeks. 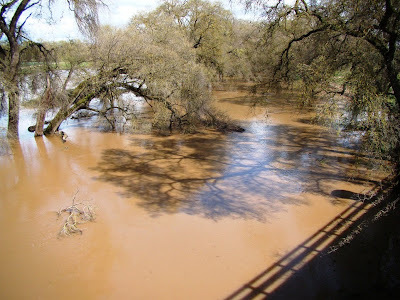 The ground is saturated from weeks of above-normal precipitation, and we had a violent wet storm yesterday that dropped several inches of rain and hail in the foothills. The creek won't stay high for long, but for a few hours today, the flow was over 3,000 cubic feet per second. By comparison, the usually much larger Tuolumne River (with the headwaters many miles away at the Sierra Nevada crest) is at flood stage at 9,000 cubic feet per second. 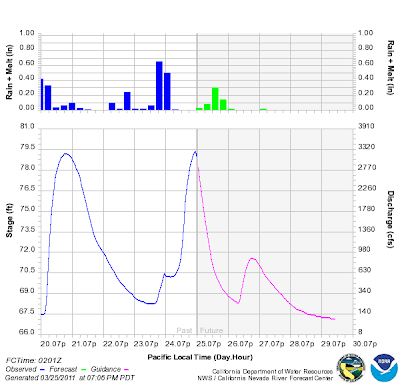 With this discharge, some properties in downtown Modesto may be flooded. Pretty big numbers for a little podunk gully. I would have shown "before/after" pictures, but I never think of taking pictures of the creek when there is no flooding going on. Stream data comes from NOAA, found here. Welcome, survivors of the Apocalypse! Like you, I have been hiding in my underground bunker, safe from the radiation cloud and protected from the supermoon and giant earthquake that caused California to plunge into the sea. I'm waiting to see if my investment in oceanfront property on the Carrizo Plains has paid off with a nice seaside view. 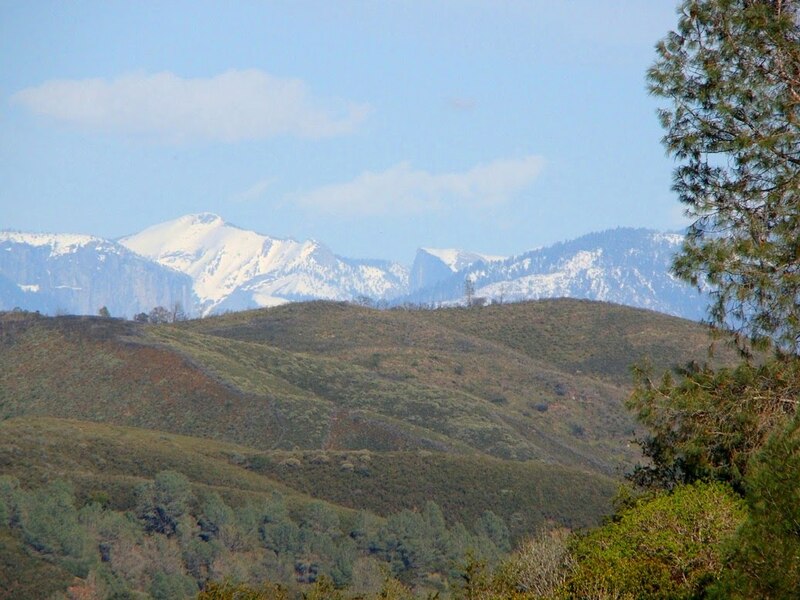 Did any of the southern California mountains remain as offshore islands? I was sort of hoping to have a few on the horizon. I've been rationing my cheetos, pringles and beef jerky. 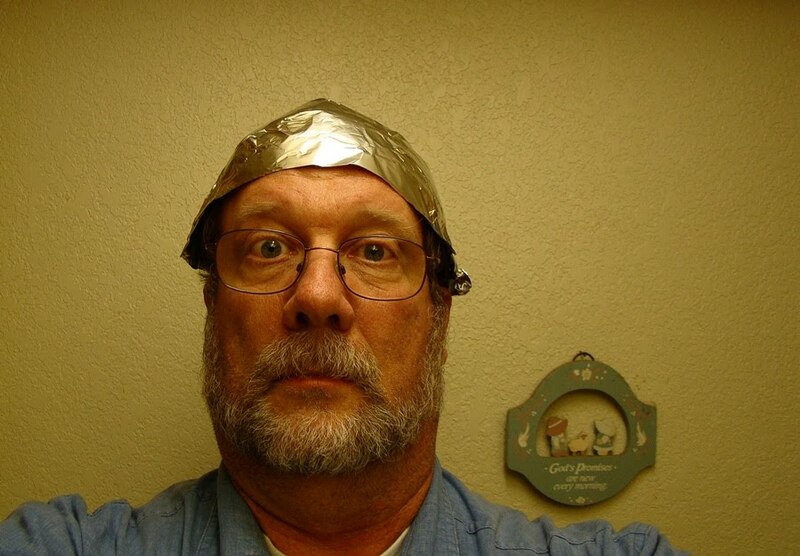 I lined my bunker with lots and lots of tin foil to protect myself from the electronic emanations of those pointy-headed "scientists" who kept poo-pooing the predictions of those who sensed the coming Apocalypse in their minds and mathematical calculations. As soon as I saw the work of the prophets on the Internet I knew it had to be true. Their prophecies were aired by the cable news networks, so I double-knew it had to be true. I didn't feel the earthquake because I built my shelter on a spring-loaded foundation. Was it really shaky? My clock broke, so I've been estimating the number of days I've been in hiding by making chalk marks on the wall; it's 2012 isn't it? The Mayan calendar came to an end and all? Have the Zombies died out yet? Well, that's that. The supermoon weekend passed and California is still here. The full moon didn't scrape along the ground and erase cities. There were no tidal disruptions. There was no earthquake. There were no volcanic eruptions. No one melted from the radiation cloud. The prophets and predictors were wrong, yet again, wrong again for the umpteenth time. Over and over they are wrong. Hundreds of times they have been wrong. And still they find a stage on the cable news networks, the Internet, the radio...over and over. There always seems to be a crowd of uninformed and misinformed people who take them seriously, and there are uninformed and misinformed news readers who are unable to critically assess their irresponsible claims. At the same time they dismiss the statements and findings of academics who have given over their lives to the study and understanding of the earth sciences. And in the end the charlatans and fakes are never brought to account for scaring people and causing economic disruptions. I've seen enough of "judgment journalism" in politics to know that cable news outlets are capable of shaming those who cross the line of honesty and decency. They are capable of using their media platform to upbraid and criticize officials who steal money or engage in hypocritical behaviour. Why are they not criticizing and shaming those who carelessly predicted earthquakes and radiation poisoning without regard to the consequences of being totally (and predictably) wrong? I have never seen the news readers take a self-proclaimed "psychic" to task for their hundreds of wrong predictions. Wouldn't it be nice just once to see a camera crew waiting outside the home of one of those self-proclaimed psychics or would-be earthquake prophets and ask them over and over why they made yet another wrong claim that needlessly scared people? Just once to hear them told to their face that they are charlatans and fakes? How long will the con artists persist when they know they will be subjected to public derision when they make their spurious claims? In the meantime, the media outlets need to learn the real facts about the possibilities of quakes and other hazards in California (and anywhere else) and make sure their audiences know the actual magnitude of the threat. The faults are here after all, and there is a lot of built-up stress. Damaging quakes will happen, and we need to all be as prepared as possible. The first thing to do is to arm yourself with knowledge. Get this knowledge from responsible government agencies like the U.S. Geological Survey, or the California Geological Survey, or academic organizations like the Southern California Earthquake Center. Then you make the appropriate preparations: keep emergency supplies of water, flashlights, radios, batteries, and first aid kits, both in your home, and in your car. Have a family plan for what to do when disaster strikes. By the way, it is ok to have pringles and cheetos in your emergency supplies...but put some healthy stuff in there too. There is junk food and there is junk news. Too much of either can be harmful to your health. 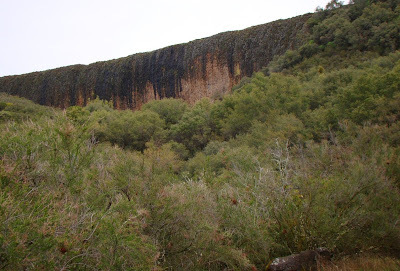 The conclusion of my backwards mini-series on the Stanislaus Table Mountain starts with an earlier trip that will serve to explain the origin of the backwards geology of our hiking destination from last weekend (parts one and two here and here). The picture above reveals our path from a slightly different point of view, mainly from several thousand feet above. Back in 2002, the father of one of my students called me early one morning and said "Let's fly my plane. Where do you want to go?" I immediately thought of Table Mountain, because it is best seen and appreciated from the air. I've been saying "backwards" a lot in these posts, but the actual term we want to use here is "inverted", as in "inverted stream". 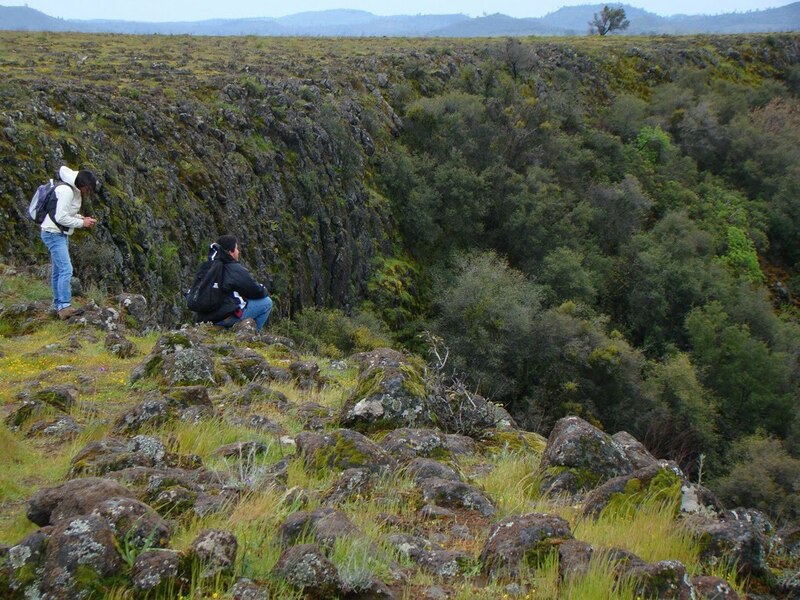 Our hike was to the top of a lava flow that sits hundreds of feet above the surrounding landscape. On first glance, this may not seem to make much sense. 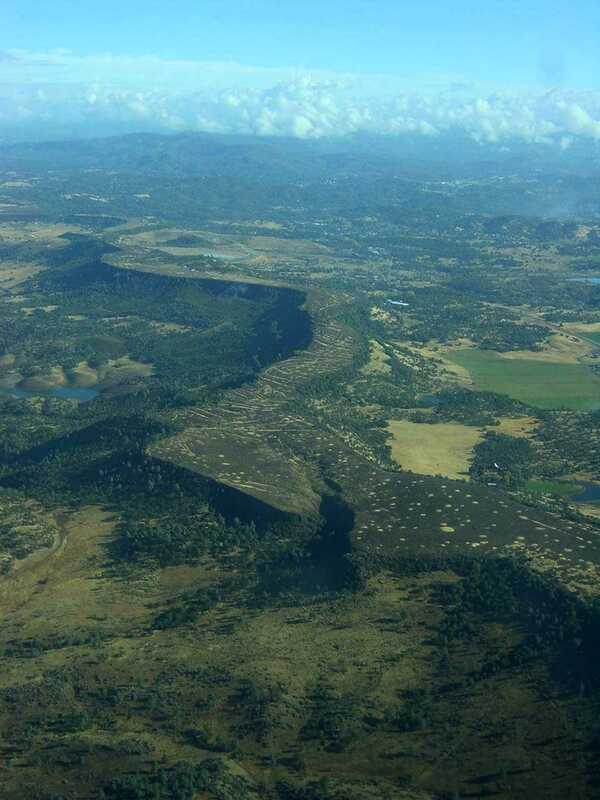 The key to understanding this oddity is to realize that the lava flow did not start out on top of a ridge. Around 6 to 20 million years ago, volcanic activity was producing ash and lava flows in the summit region of the growing Sierra Nevada in the vicinity of Sonora Pass and the Dardanelles. 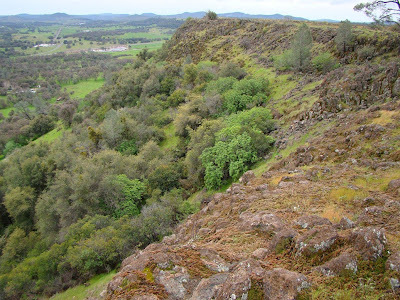 The earliest volcanic activity included violent explosions of light colored rhyolite ash that coated the Sierra foothills (the Valley Springs Formation), but later eruptions mixed with water and snow to form volcanic mudflows (called lahars). These mudflows and river deposits coated the foothills region hundreds of feet deep, a series of layers called the Mehrten Formation. In the picture above, the layers form contours on the sides of the hills. For those familiar with the Knights Ferry area, the Mehrten forms the cliffs of Lovers Leap. In the midst of this activity, about 10 million years ago, a single flow of latite (a sort of orthoclase bearing andesite) traveled more than forty miles down the western slope of the rising mountain range. Having flowed far beyond any volcanic slopes, the lava followed a riverbed, an ancestral path of the Stanislaus River. The picture below reveals the winding path the lava followed (our hike was located right in the center of the photograph). The surrounding rock was easier to erode than the latite, so when the mountains continued to rise, the lava flow remained while the other rocks were carried away. The bottom of the river became the top of the ridge: a textbook example of an inverted stream. Farther "downstream" the lava flow widened considerably, forming a more plateau-like landscape. The Stanislaus River ended up carving through and around the lava flows. 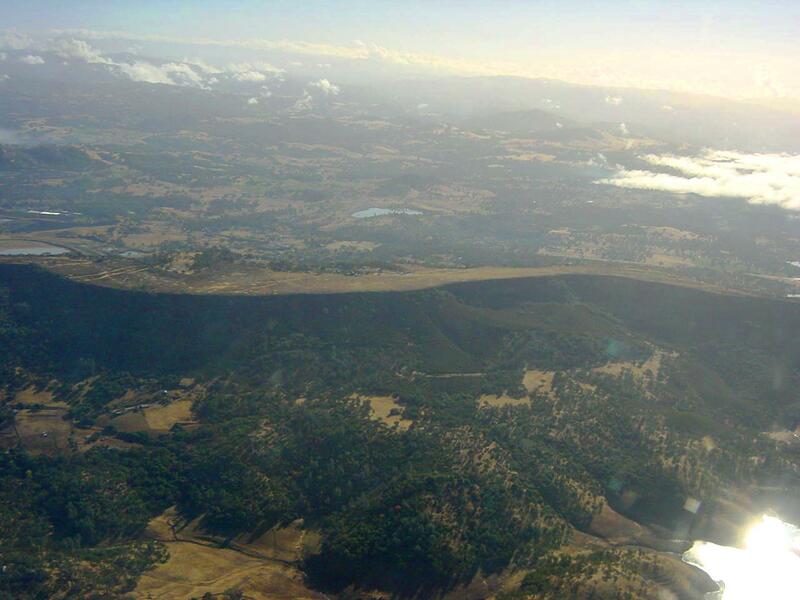 Some of the steep gorges became idea sites for modern-day reservoirs, like New Melones and Tulloch, seen below. 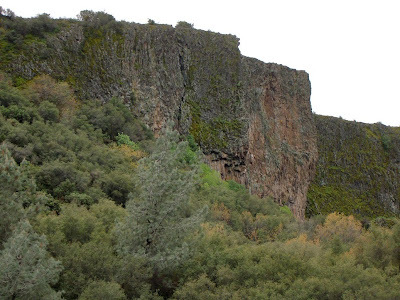 The Table Mountain lava flow disappears beneath the slopes around Knights Ferry. I mentioned in the previous post looking over towards the Harvard Mine from the summit ridge of Table Mountain. 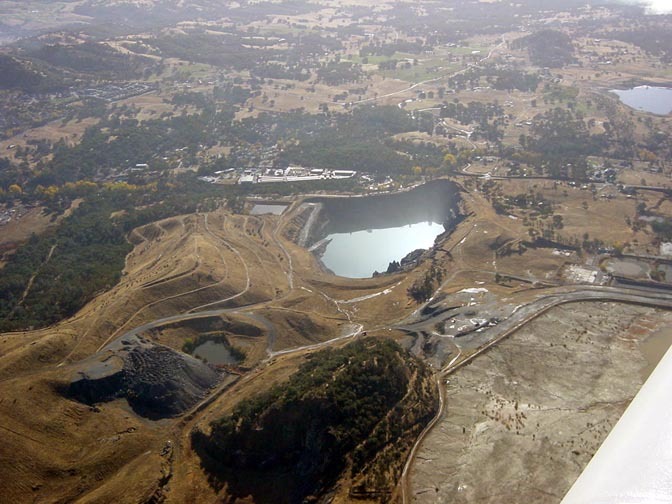 The open-pit mine was active from 1986 to 1994, producing about 660,000 ounces of gold from about 17 million short tons of rock. The lake in the pit is about 300 feet deep. Just prior to closing down, the miners recovered a huge mass of crystallized gold, weighing more than 40 pounds. The gold is on display at the Ironstone Winery in Murphys. It was a lot of rock that was removed and piled up to get at the gold. So not only is the local landscape inverted, it has also been turned inside out. I hope you've enjoyed these vignettes of my pair of journeys to a backwards landscape! The flight was made possible by Ken Iwahashi of KKI Corporation in Modesto. I have a web page with additional pictures and descriptions of the flight at Geotripperimages.com. 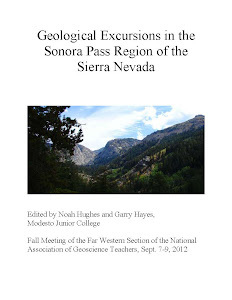 Busby, C.J., et al., 2008, The ancestral Cascades arc: Cenozoic evolution of the central Sierra Nevada (California) and the birth of the new plate boundary, in Wright, J.E., and Shervais, J.W., eds., Ophiolites, Arcs, and Batholiths: A Tribute to Cliff Hopson: Geological Society of America Special Paper 438, p. 331-378. 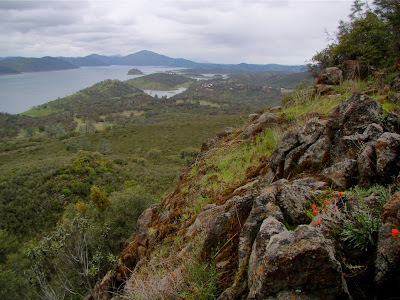 Continuing our previous blog entry about exploring part of the California Mother Lode, we reach the summit of Table Mountain, near New Melones Reservoir. We had made our way across some grassy meadows and oak woodlands, and then climbed up a steep talus slope through brushy thickets to reach the edge of the summit. We walked into a strange forbidding landscape. The summit of Table Mountain at first looked barren and practically lifeless, but it took only a moment to realize it was full of life, especially on this particularly strange day of rain and storms. As I wandered across the summit plateau, I realized that something was missing: fields of waving grass. It was striking. In the meadows below, exotic grasses were growing profusely everywhere. Up on top, grass was present, but as can be seen below, it is dominated by other plants; especially small flowers and mosses. Clearly the soils were very thin due to the nature of the lava, but these non-grass plant species were doing just fine, from the looks of things. 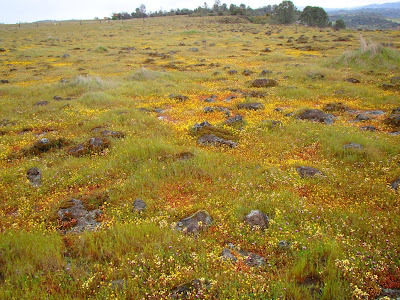 From what I could understand from some of the environmental studies of the volcanic tablelands, the exotic grasses have never really established themselves on the plateau the way they have in the pasture lands and meadows below. It's too tough of an environment. Apparently, most of the plants up here are natives. It is a mostly dry and hot environment for much of the year, but for a few weeks or months, rain fills a number of low areas called vernal swales, which provide a unique growing environment for endemic species. 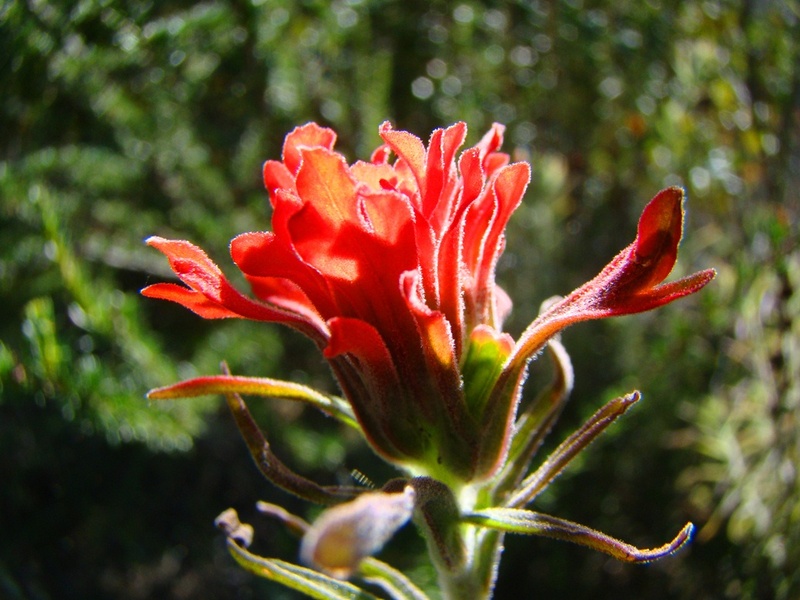 Invasive exotic species cannot tolerate the extreme conditions. 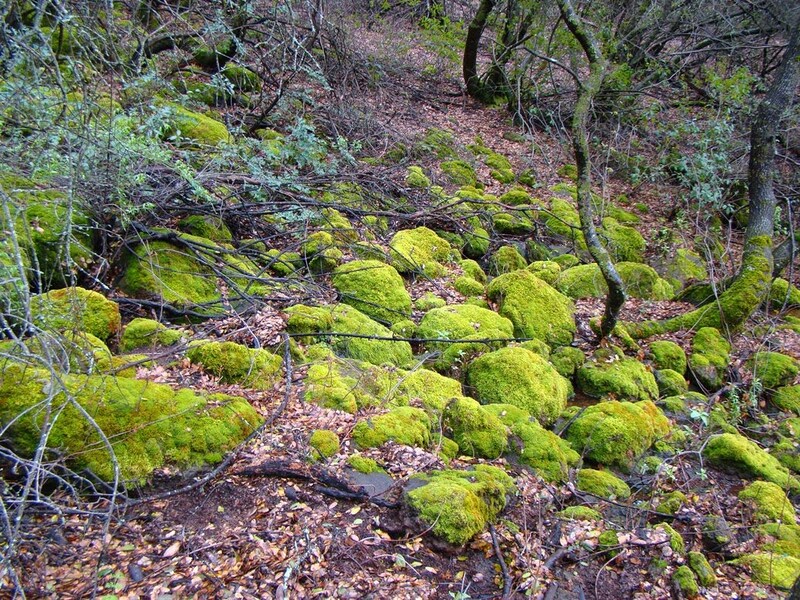 The vernal swales are broadly similar to the vernal pools found on the floor of the Central Valley (in the few undeveloped areas), but are more rocky with less clay. I saw quite a few unfamiliar flower species. The colors were vivid, despite the grayness of the skies. Actually, as I looked around the skies were not just gray, but threatening. Rain was falling all around us, and a bitter cold wind was sweeping across the summit plateau. I wasn't quite ready to retreat just yet. I got on my hands and knees and realized I was looking at an entire ecosystem on the surface of a single boulder (below). It was an incredibly colorful palette of living things, and a wonderful confluence of geology and biology. "Vernal pools are an ephemeral wetland vegetative community with predominantly low-growing, ephemeral herbs. Germination and early growth occur in winter and early spring, often while plants are submerged, and pools dry out by summer. 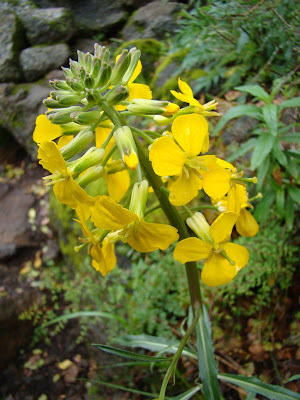 Flowering is often in bands at the margins of the pools. This community type occurs in shallow depressions, ranging from a few meters to tens of meters in diameter. Characteristic plant species found in vernal pools are Pacific foxtail (Alopecurus saccatus), common blennosperma (Blennosperma nanum), Cleveland’s shooting star (Dodecatheon clevelandii var. patulum), toothed downingia (Downingia cuspidata), spinysepaled button-celery (Eryngium spinosepalum), hedge-hyssop (Gratiola ebracteata), Fremont’s goldfields (Lasthenia fremontii), Douglas’ meadowfoam (Limnanthus douglasii var. rosea), white-headed navarretia (Navarretia leucocephala ssp. leucocephala), adobe popcorn flower(Plagiobothrys acanthocarpus), miniature popcorn flower (Plagiobothrys stipitatus var. micranthus), Sacramento pogogyne (Pogogyne zizyphoroides), Delta woolly marbles(Psilocarphus brivissimus var. 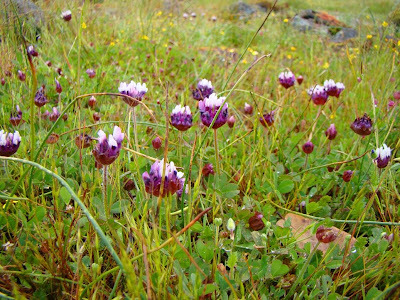 multiflorus), greater duckmeat (Spirodela polyrrhiza), and Wildenov’s clover (Trifolium willdenovii) (Stone et al. 1993 in Reclamation 1995). 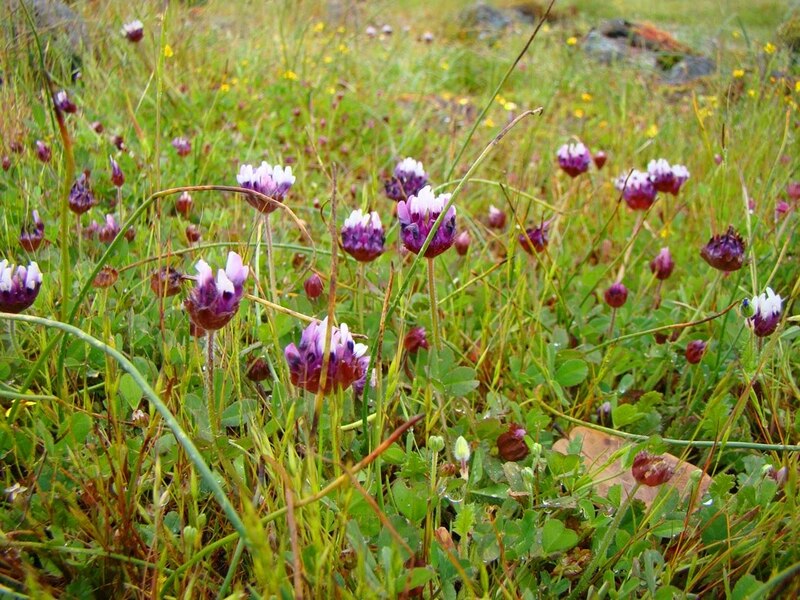 Special status plant species that may grow in the planning area vernal pools include Sacramento orcutt grass (Orcuttia viscida), slender orcutt grass (Orcuttia tenuis), Bogg’s Lake hedge-hyssop(Gratiola hetersepala), and legenere (Legenere limosa). 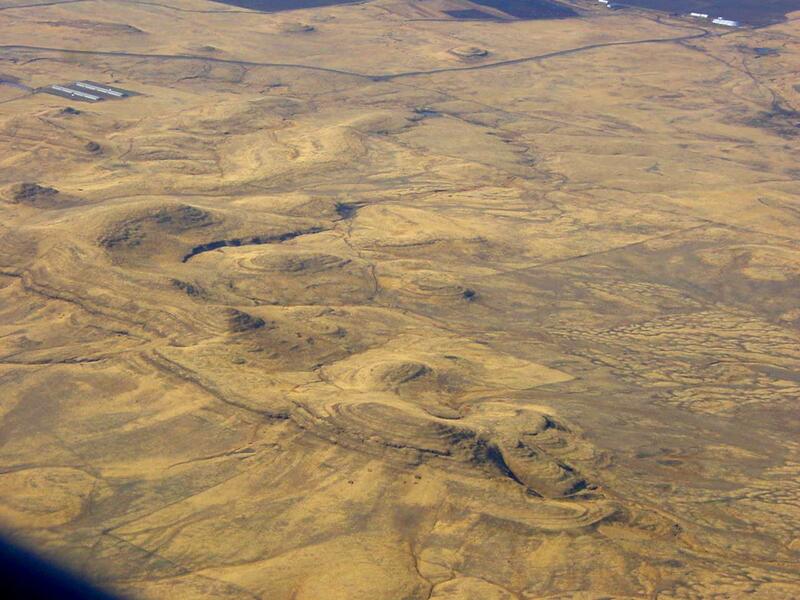 Within the planning area, intermittently-formed pools appear after rainfall or snowmelt on top of Table Mountain between 1,200 feet in elevation in the south and 2,600 feet in the north. Although these pools share some of the characteristics of some vernal pools in the Central Valley, they are not true vernal pools in that they do not have a clay underlayer that prevents percolation. Instead, they form in swales in the rocky surface of Table Mountain. 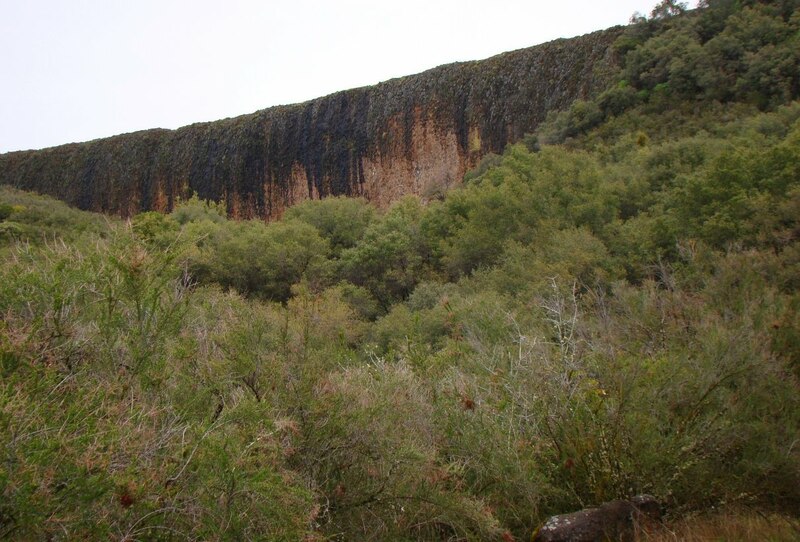 The soil is poorly drained and the parent material on Table Mountain is a Pliocene lava flow (andesite). 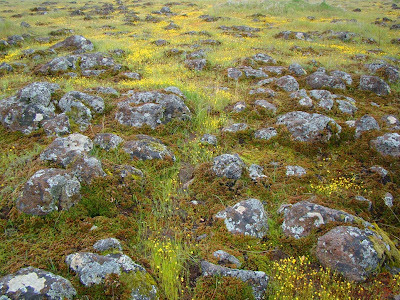 Intermittent pools occur on Table Mountain in seasonally wet to saturated rocky meadows that have slight soil development (Evens et al. 2004). They are interspersed within the annual grassland (Reclamation 2006b). 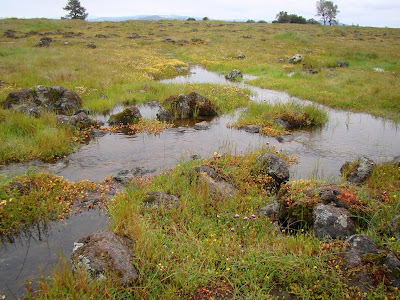 Intermittent pools at Table Mountain do not support the range of species found in vernal pools in the Central Valley, possibly due to differences in substrate(primarily shallow, rocky substrate versus clay substrate in valley vernal pools). Although vernal pool habitats are very delicate and easily disturbed in general, this is even more pronounced on Table Mountain where soils are poor, shallow, and loose. 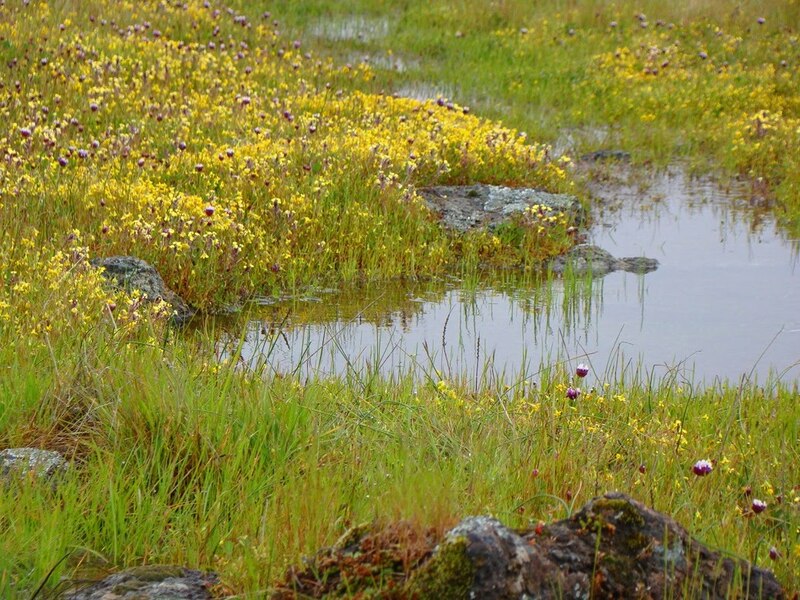 To date, vernal pools have resisted invasion by exotic plant species, probably due to their ephemeral nature (USACE 1997). 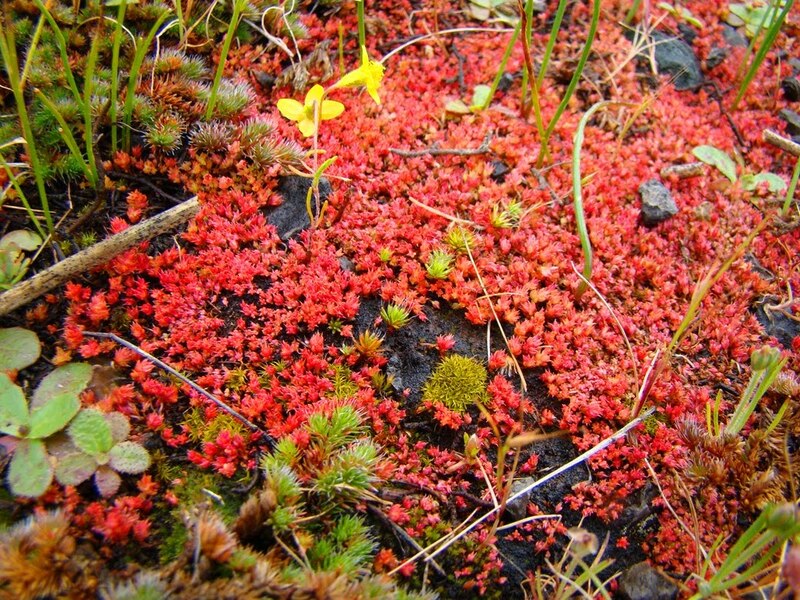 However, the scientific community is concerned that exotic plants may colonize vernal pool communities, possibly displacing the highly specialized native vernal pool species (USACE 1997). 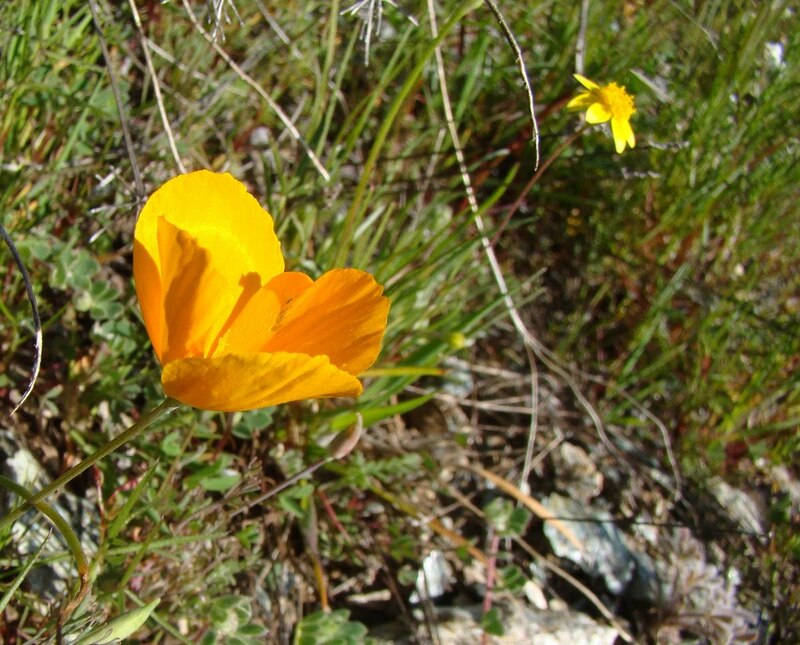 Despite these concerns, there is no supporting evidence that this change is occurring in vernal swales found on Table Mountain (USACE 1997). So much of the time I am showing people a place that is new to them. It is always fun to show someone the treasures that exist practically in their own backyards. On this hike, I got that experience of seeing a place for the first time. I loved every moment! This blog was prompted by another flurry of requests from students and readers about someone somewhere predicting that we would have a big quake in California tomorrow; I won't provide links. They scare people needlessly, and it is irresponsible. Anyone can predict quakes. But no one can predict large quakes with any kind of accuracy that will save lives. We can make long-term evaluations about the chances that a particular fault will rupture within a period of decades. But we can't predict big quakes a few days in advance. Anyone who says so is plain flat-out wrong. They will keep predicting quakes one after another, and one of these days, one of their hundreds of predictions will come true, and they will cash in. Update #1: A nice explanation of why we can't predict big quakes can be found here. 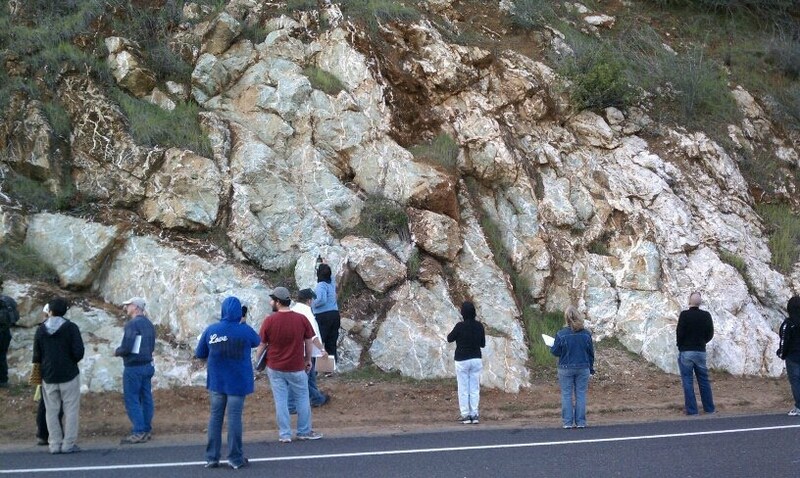 Another day in the field...today it was our Geology Club. It's not enough that I make my students work hard in the classroom and lab, and drag them on field trip courses. The club members raised the funds to go out on their own and see something new and different. Once again the students led the teacher; I even rode in the back of the van! Yup, backwards day it was, in many different senses. Strange as it may seem, I had, after twenty-two years in this region, never been to the top of what may arguably be the most famous geologic feature in our immediate vicinity. I've flown over it (a near-future blogpost), driven beneath it countless times, driven over it through a couple of erosional breaches, but I have never stood on top of it. So today I got to check off one more item on my life list: climbing the Stanislaus Table Mountain. Things were backwards in a number of ways. We found the sweet spot between two powerful storms that are battering California this weekend. Yesterday there was so much snow that Highway 80 had a 45-car chain reaction accident and got closed in both directions. Right now the winds outside are gusting to frightening levels. 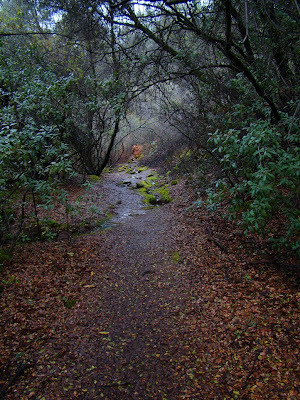 But for four hours this morning the rain in the foothills let up, and we had a pleasant hike, aside from a bitter cold wind at the top. But instead of a normally hot and arid landscape, we had a muddy trail, rivulets of water everywhere, and waterfalls where waterfalls pretty much never happen (see above). The trail to the summit starts at the end of Shell Road off of Rawhide Flat Road near the gold rush town of Columbia. "Summit" is not the best term though because Table Mountain is not a single peak at all. It is a flat-topped ridge that winds for many miles through the Sierra foothills. 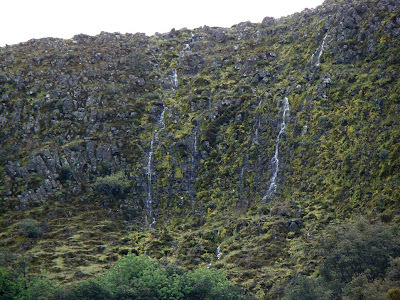 It is composed of a basalt-like volcanic rock called latite, and the lava flow displays some interesting columnar jointing in places (below). The flow is 9 or 10 million years old. How did it get to the top of the ridge? That question will be dealt with at a later time. The trail crosses gently sloping meadows and oak woodlands for a mile, and then turns and climbs steeply for a half mile to the summit ridge. The ecosystem changes drastically as the trail climbs the north-facing slope. 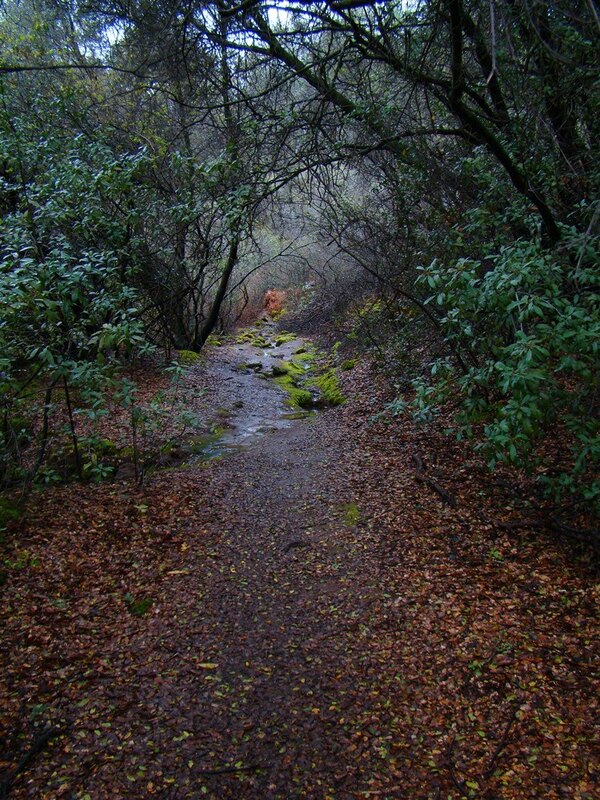 The path is shaded by numerous trees and shrubs, with some unexpected species for a region that regularly reaches 100 degrees in the summertime. It's a thicket, really, and I'm glad we had a trail to follow instead of bushwacking. The poison oak would have been a real problem! In the picture below one can see the edge of the barren summit ridge. 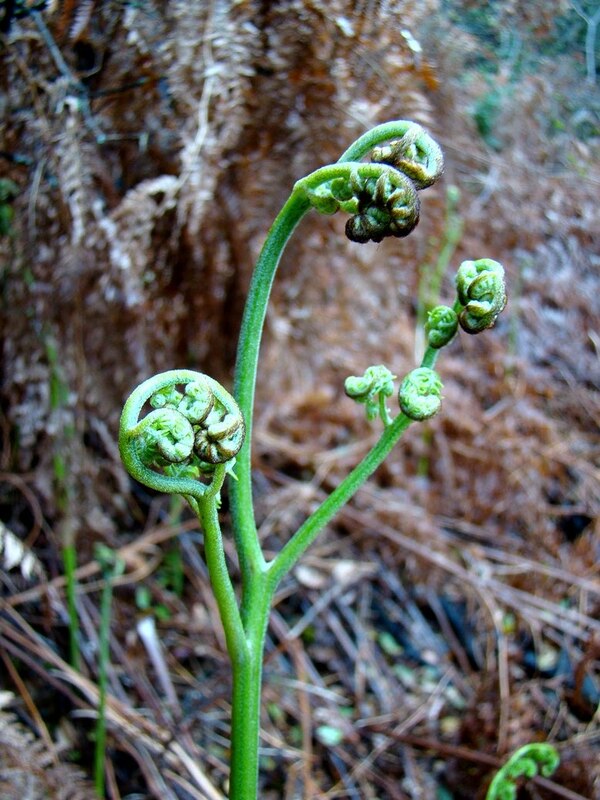 We passed a glen full of ferns opening up for the first time among the brown husks of last year's crop. 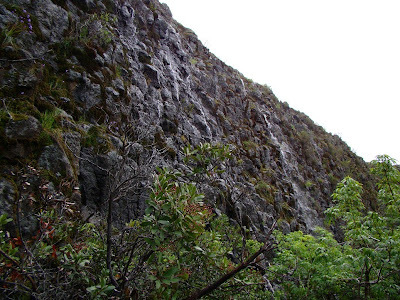 The slope we were climbing was composed of large fallen boulders from the lava flow, a feature called a talus slope. The openings between the boulders can extend hundreds of feet into the slope, and cool moist air will seep out of the slopes all year long. 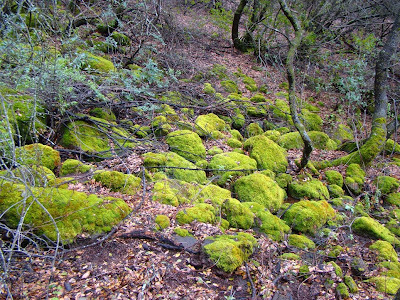 Mosses cover the boulders. 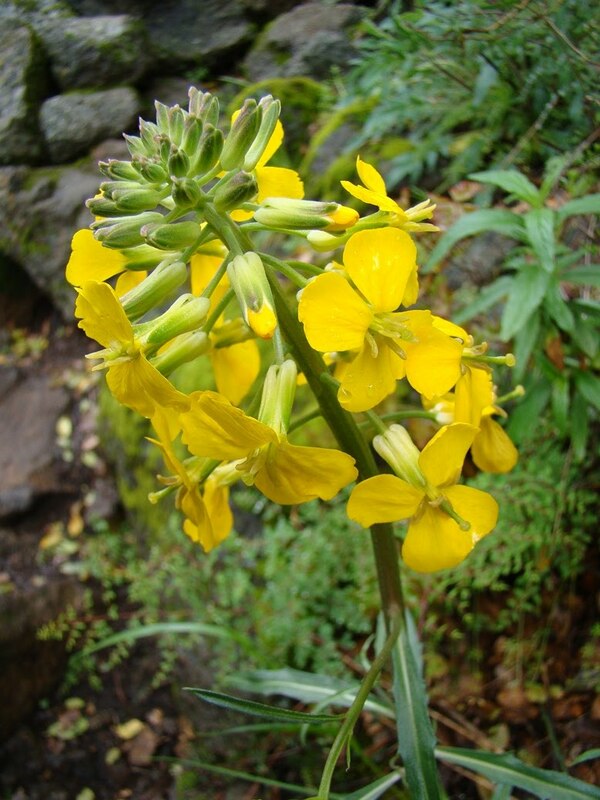 I hope my flower-loving friends will identify the flower for me...I haven't noticed this species before (mind you, I'm a geologist, and flowers are as much a mystery to me as minerals are to botanists). It was fairly common and obvious on the shaded slopes. We were nearly to the top, and had a close up view of yet another series of small ephemeral waterfalls. A few more switchbacks and we would reach the summit, the "top" of Table Mountain. Our backwards story will continue in the next post! Shock Jocks Attack My Students: Who Serves Society Better? So let's see. I have hundreds of students in my classes every year whose goal is to better themselves, and to work for the betterment of society. They are young students just out of high school who are seeking direction, they are single mothers trying to get off welfare and start working, they are newly jobless working to learn skills for a new career, they are retired people who want to learn something new. They have goals for their lives, and we are a pathway for them to achieve their goals. When I say they want to work for the betterment of society, I mean it. Among my many students are idealistic people who want to become police, nurses, firefighters, and teachers. So, I get word that some shock jock radio guys named Ken and John at KFI Radio in Los Angeles think that community colleges are a scam, and that the students who attend are parasites. Let's see what I remember from my core biology class at Chaffey Community College: A parasite is a creature that attaches itself to some kind of host, and draws its nourishment from the blood or organs of the host without giving anything in return. Parasites weaken and cause damage to the host organism. Tapeworms are an example of a parasite. On the other hand, there are symbionts. In symbiosis, organisms also draw nourishment from their host, but they give something back. There is a mutual benefit in the relationship. Bees draw their nourishment from flowers, but in traveling from one flower to another, they pollinate and allow the plants to reproduce and flourish. Which of these describe the students with whom I work every day? And what term describes ignorant radio hosts? It seems that conservatives have long pushed the idea that people have to take personal responsibility for improving their lives. I've heard them say that people don't have the right of "equality" of resources (i.e. socialism), but that they should have equality of opportunity. I don't disagree with this. It is, in fact, why I teach. I want to give all my students the opportunity to succeed, and I work very hard to encourage them. And they work very hard to achieve their goals. Some fail. It happens. But many of them succeed against very long odds. I gain so much from my relationship with my students, and society benefits as they become qualified for better jobs and careers, especially in the fields where they help improve the lives of others. If you want to look at it from a purely economic point of view, educated people have better jobs, have more money to spend on products and services, and pay more in taxes. By the way, the website of these same men has pictures of the Republican state senators and assembly people who are still negotiating on the budget with stakes through their heads and bird droppings on their head. Does such violent imagery have a place in our societal discourse? I hope you will consider contacting these legislators and tell them you support the community college system. I am proud of my students. I am proud to be a teacher. I am proud to be part of the single largest system of higher education in the world with 2.7 million students, a system that trains 80% of our police and firefighters and 70% of our nurses. And I am appalled when people like Ken and John are given such a loud platform to spread their ignorance and hate. I would ignore them, but apparently they have one of the larger audiences in the south state. People like Ken and John are the true parasites. The state flower growing in the state rock next to a site where the state mineral was being mined...the only thing missing was the state mammal, and it's been missing for 80 years. On second thought, I would prefer not to have run into our state mammal anyway. It's the California grizzly, after all. I am talking about an early spring arrival California poppy growing in an exposure of serpentine along a fault in California's Mother Lode where gold was being mined from the 1850's through the 1930's. I was in the field last Saturday! It's been an emotionally tough week. The sorrow and grief over the earthquake and tsunami in Japan, compounded by the ongoing meltdown at the Fukushima nuclear power plant has been bearing down on most of us. We face draconian budget cuts in our state educational system, and friends and fellow workers received layoff notices this week. Science is under attack at a time when it needs to be upheld as a way of working through serious and profound problems that face society in agriculture, energy and climate change. But the right questions aren't even being asked or discussed. We were exploring the southern Mother Lode between the Gold Rush towns of Mariposa and Jamestown, and learned how the gold was mined, how it formed, and a bit about the environmental devastation the mining caused. We got to collect the gold ore, quartz crystals, a rare chromium mica called mariposite, and pyrite. We also had a nice view up the Merced River towards Yosemite Valley! El Capitan is the steep cliff on the left, the tip of Half Dome appears just left of center, and Clouds Rest is the snowy peak behind El Cap. We started at the dredge tailings around Snelling and Merced Falls. 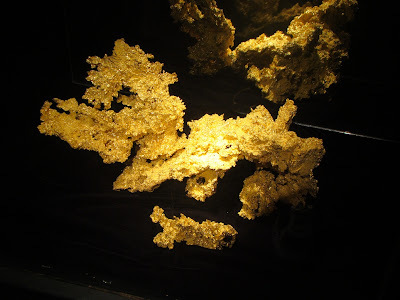 To get at microscopic bits of gold that had been carried down the rivers into the Central Valley, the mining companies dug holes down to the groundwater table, forming ponds in which they floated a factory ship that dug out one end of the pond, processed the sediments for gold, and dumped the waste on the other end. They worked their way across the landscape, ripping up the topsoil and leaving behind square miles of rockpiles. 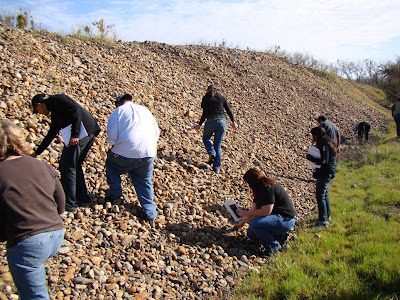 The land is mostly useless now, but it provided us an opportunity to identify the kinds of rocks that occur upstream, and which reveal something of Sierran history. There was quartzite (baked and pressurized beach sands), metavolcanic greenstone, slate, and occasional fragments of marble and granite. Three quarters of the rocks found in the Sierra are various types of granitic rock, but in the Mother Lode, the more ancient and more common metamorphic rocks tell a story of ancient shorelines, terrane collisions, volcanism and other activity. These rocks are far older than the granitic intrusions. Later in the day we explored an abandoned gold mine (just the outside, mind you) where we found the most interesting minerals, and found the famous outcrop just west of Coulterville where we could see the minerals and rocks in their original arrangement. 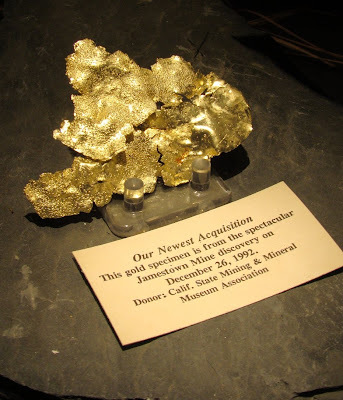 This stretch of the Mother Lode was relatively barren of gold, so the outcrop was not mined like so many others. It was nice to see them discussing and exploring the outcrop! That doesn't always happen. 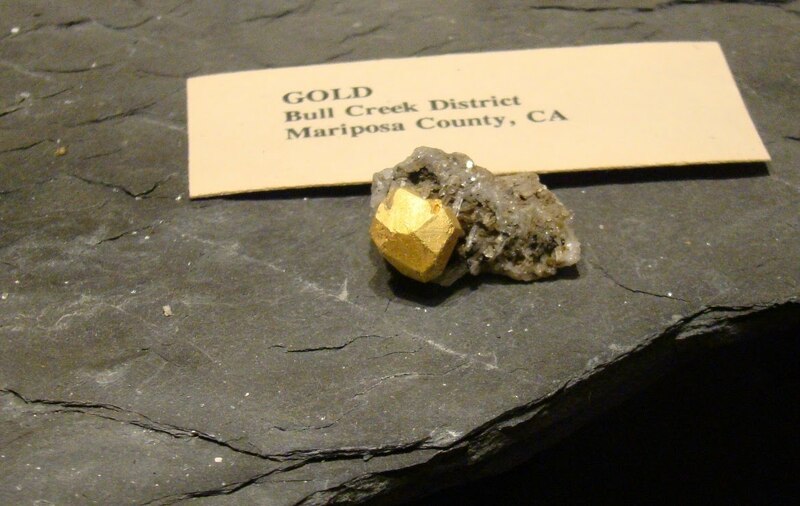 Our day included a stop at the California State Mining and Mineral Museum in Mariposa, where a great many spectacular specimens are on display. I photograph a different group of minerals every time I visit, and somehow I concentrated on the gold this time. The leafy gold above is a piece of a larger 44 lb nugget discovered at the Harvard Open Pit Mine just before it closed down in the 1990's (the big nugget is on display at the Ironstone Winery in Murphys, a bit farther north just off of Highway 49. Below is the Fricot Nugget, weighing in at 13 lbs. It's the biggest specimen on display, and one of the largest to survive the Gold Rush era without being melted down. 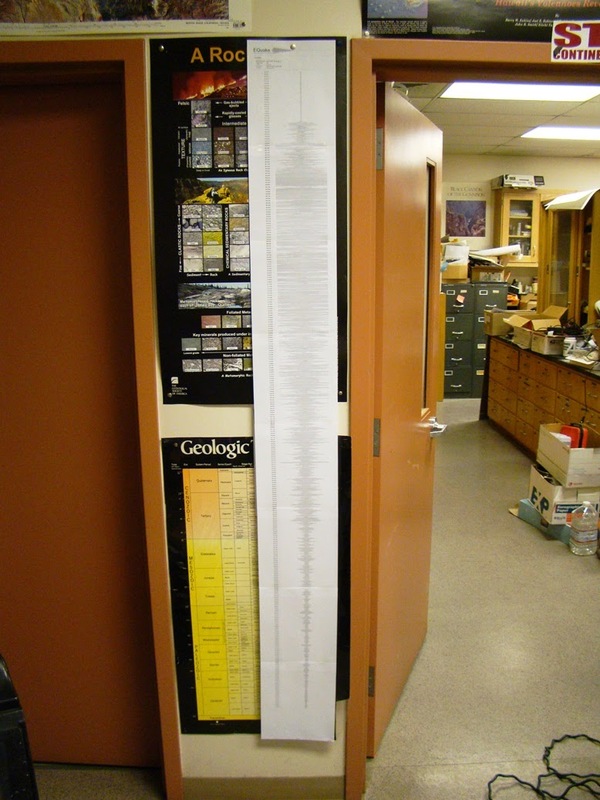 If you are curious, the largest single specimen ever found in the state weighed just short of 200 lbs. It got melted down, but a replica is on display in the museum. Strangely enough, the specimen I found most interesting was one of the smallest. We tend think of gold as nuggets that have been rolled in a stream and rounded off. We don't often think of gold crystals, but there it is below. Gold crystallizes in the isometric (cubic) system, but not generally as square cubes. The specimen below looks to be more like a dodecahedron. Across from the mine site we took a brief excursion into the Earth's mantle, which is normally found many miles below the crust, but which been pushed up to the surface along a major fault system. 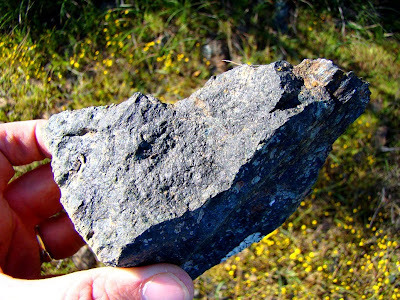 Most of the mantle rock (peridotite)has been altered to serpentine, but we could find some chunks of mostly unaltered mantle material. We ended the day with stops to look at the abandoned Harvard Open Pit Mine that operated in the 1980's and 1990's, and at Table Mountain near Jamestown, a famous example of an inverted stream. I may have more to say about it next week, since our geology club is intending to climb it this weekend (in the rain, probably). All in all it was a good day, a brief respite from sorrow, and a day of being inspired by the enthusiasm of some great students. The other day I provided a few screen shots of the seismic record that we captured in Modesto of the Sendai Earthquake in Japan. 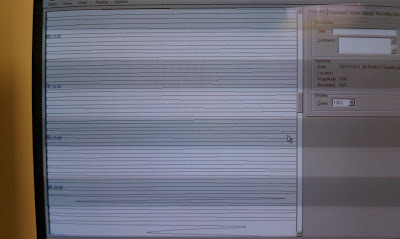 As I noted in that post, our seismometer is an old teaching model with deeply outmoded computer software, and all I was able to show were some screen shots. 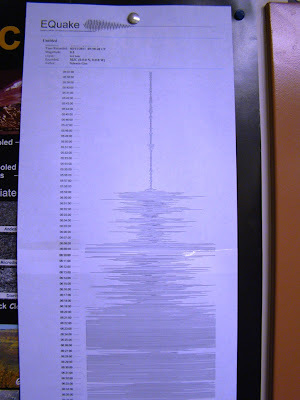 Well, I loaded the program on an older computer in the department, transferred the earthquake data to a floppy disk (remember those?? ), transferred the data onto a third computer where I could transfer the data to a CD-ROM, and finally was able to send the output to a printer. So today I offer the complete record. It's kind of astounding. The top picture is the initial minutes of the quake. You can see the amplitude of the waves rapidly increasing until they were off-scale. The notations on the left are the elapsed minutes, four minutes to the inch. ...but it was the kind of day that demands teaching. My first day back with classes after the magnitude 9.0 quake and tsunami in Sendai, Japan, and the perfect teachable moment. Only it doesn't feel like a teachable moment. I just felt sorrow. So much is going on, and the situation seems to change hour to hour. First it was a magnitude 9.0 earthquake. Those don't happen very often, and that would be enough by itself to toss out the lesson plan of the day and discuss earthquakes and magnitude. But then there was the horrific tsunami that changed everything. 80 miles is a pretty good distance to be from a magnitude 9 quake, and it looks like the structures along Japan's coast weathered the shaking pretty well. But the tsunami raged through and erased towns, wiping them out of existence. Without the tsunami, the quake would have been a footnote. With the tsunami this event became the ultimate human tragedy. Thousands dead, hundreds of thousands homeless. It's hard to even speak of it, much less try and understand the pain and suffering that is taking place across the sea. But then a new threat; the nuclear power stations began failing one after another in a story that is still unfolding. A human-induced tragedy superimposed over a nature event. We've concentrated radioactive substances in order to produce a form of energy, and the engineers have always told us that it can be made safe. Despite Three-Mile Island, despite Chernobyl, despite the other 30 'incidents' in the past 50 years. We've 'learned' from each of the accidents, it is said. They can't happen elsewhere. We have back up systems. We can't give up nuclear energy they say, because it is the bridge to a renewable energy future. Otherwise we'll have to burn more coal, and coal contributes to global warming. In all of the chattering among the talking heads on cable news this weekend, I have heard nothing of the threat of terrorism at nuclear power plants, nor have I heard anyone talk about where the highly radioactive waste is going to go. We've been avoiding the second problem for 50 years now. Will these questions start emerging, or will they disappear once the meltdown is complete, or once they stop the meltdown from occurring. So the lesson plan for the day is tossed. We talk about the earthquake, the tsunami, the nuclear power plants. Questions, one after another. Some I can answer, some I cannot. 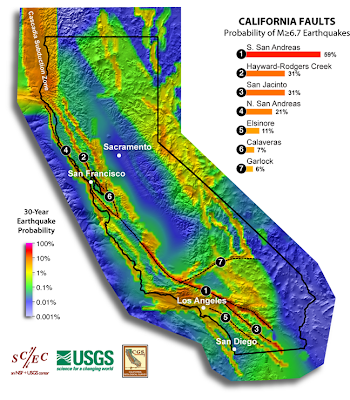 Can we have a magnitude 9 quake in California? Yes and no. The legendary San Andreas fault can produce events in the range of magnitude 8, about 1/30th of the size of the Sendai earthquake. Many other faults in California have produced dozens of quakes in the range of magnitude 6.5-7.5, and some have been very damaging. Magnitude 9? Not exactly. The Cascadia subduction zone lies off the coast of Northern California, and extends across Oregon and Washington. That system produced a magnitude 9 quake in 1700. Studies show such a quake takes place every few hundred years. Such a quake would have devastating consequences in NorCal and the Pacific Northwest. Are the nuclear power plants going to have a full meltdown? I have no idea. I'm not an expert, and I don't know that the experts even know. Will we be hit by a dangerous radioactive cloud? I don't think so, the experts say it will dissipate in the atmosphere and fall into the ocean before it gets here. I'm more worried about the people who live in the vicinity of the power plants. If the worst case scenario happens, the land they have lived on all their lives could be declared uninhabitable. Where will they go? I'm glad the meltdown didn't happen here. How many of you know where your energy comes from? California has two operating nuclear power plants, both on the coast, both near fault systems. Another mothballed power plant sits unused just 80 miles from us, with all the fuel rods on site. The engineers for the plants say they're ready for whatever happens (I bite my tongue to avoid getting political). Can a tsunami hit us in the Central Valley the way it did in Japan? 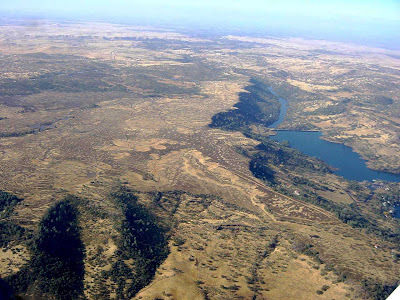 No, not likely, but we have a different problem: the Sacramento Delta. The three dozen or so islands in the Delta are 'protected' by century-old levees that are prone to failure from causes as simple as excessive muskrat burrowing. The islands have sunk over the last century, and most are now below sea level. A moderate quake on nearby faults could cause widespread failure and flood the islands with seawater. If it were just lost farmlands, we could deal with it. But the intake pumps for the California Water Project are in the midst of the islands and the inundation could cut off the water supply for 20 million people for months, if not years. What will the "Big One" do to us? It depends which "Big One" you are talking about. A repeat of the 1906 earthquake in San Francisco? Or the 1857 Fort Tejon earthquake? 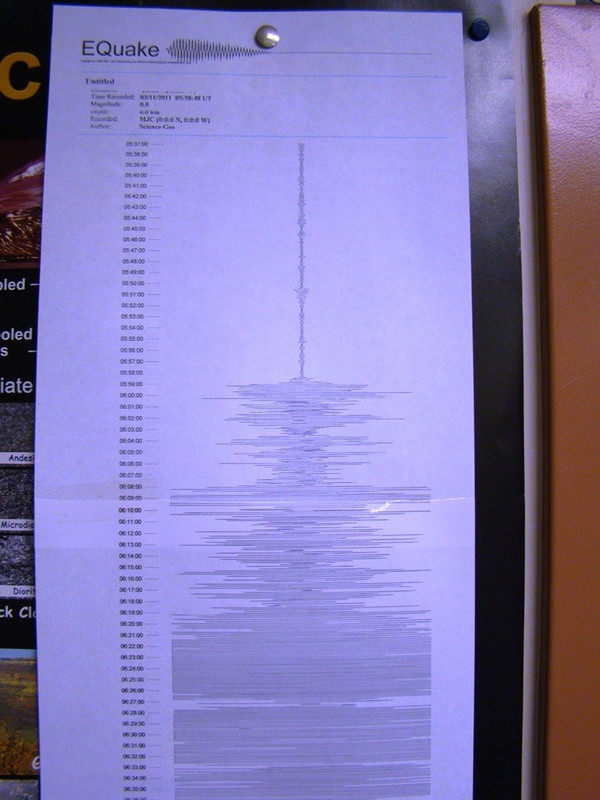 Or the 1872 Lone Pine quake Or another? All of them were close to magnitude 8, and if they happened again, the results would be profound. And there are dozens of other active fault zones in California. But here in the Central Valley? Harder to say. The 1906 quake was certainly felt in the region, but didn't do much damage in our town. Cities and towns on the west side of the valley will have some serious problems with shaking and liquefaction, but we are on relatively stable sediments. Where's the best place to live? Kansas or Nebraska I should think. But watch out for tornadoes. Here in California, I would pick the Sierra foothills. Solid bedrock foundations and relatively far removed from the most active fault zones. Do you have questions? Use the comments section to ask and I will answer if I can, or find an answer somewhere. It has been a week that will long seared into our collective memories as we watched a tragedy unfold in real time in Sendai, Japan. An earthquake of magnitude 8.9-9.0 struck about 80 miles offshore, with a horrific tsunami that did incalculable damage along the coast of the island. It then spread throughout the Pacific Basin, and the effects of the quake became worldwide in scope. Whether one realizes it or not, every human being on the planet was touched by the shaking. Not in some metaphysical new-age sense, but literally. The waves were detectable for hours on seismometers worldwide, meaning we were all rising and falling whether we were aware of it or not. We were all part of this story. Many will watch an event like this unfold and try to find some meaning. In one sense, there was no meaning; this was something the Earth does. Subduction zones have been active on this planet for billions of years, and will continue to be active for billions more. The oceanic lithosphere shifted a few tens of feet deeper into the mantle, where it will eventually be melted or distorted beyond recognition. The materials disappearing from the surface today will eventually reappear, as part of a volcanic eruption, or as a fault sliver along some plate boundary in some future era. Events like this are common beyond measure; the Earth has experienced millions upon millions of huge earthquakes like this one, and though life is extinguished in some areas, life in general goes on. This quake meant nothing in the long run. On the other hand, there was much about this tragedy that has meaning. With our brief life spans measured in decades, we will rarely experience such events in our personal lives. I could never wish such tragedy on anyone, but we also learn that living on this planet means that we are sometimes exposed to extreme deadly events. If not an earthquake, then a volcanic eruption. If not an eruption, a deadly flood. If not a flood, then a searing heat wave, or freezing blizzard. No one is totally safe or immune from these events, and most of the time we are not really aware that they can happen to us at all. They come as a total surprise. In earlier centuries, such events elicited cosmic and supernatural explanations. It was the capricious nature of the gods that caused these terrible punishments. These people must have done something wrong to deserve such horrific retribution. If we couldn't think of an explanation, we made one up. I would love to say we have somehow moved on from this kind of thinking, but charlatans like Pat Robertson and others remind us constantly that ignorance and hate are alive and well in our society and across the world. Why is geology important? Geology provides us with a new mythology of the world, one that based on a better understanding of the processes of our planet. We don't just see an earthquake happen on the surface and jump to the conclusion that the giant turtle that underlies our bit of land has taken a few steps. Instead we explored new pathways to knowledge that revealed that the earth itself is releasing energy to space, and that one of the ways that this happens is through the movement of lithospheric plates. Do we know the absolute truth? No, we don't. That's why we seek to learn more. We can now predict where earthquakes are likely to happen, but we cannot tell when, at least not well enough to save lives and property. If we are to live at the limits of sustainability on this planet, we need to know all we can about it. Why is education important? Everyone has a right to know what geologic hazards may affect their lives. It should be a fundamental human right. It's not, but we can make the effort to make sure that people know what can happen, and help them to prepare for it. I live on a plate boundary, and a major earthquake is likely to strike close to my home. But I know from personal observation that people in California are shockingly unprepared for a major seismic event. Few have an emergency kit in their home, or a plan for what to do in the event of a major quake. Few people know the location of the legendary San Andreas fault, and even fewer can name any of the dozens of other active faults that exist in our state. We see the unfolding disaster of self-destructing nuclear power stations in Japan, and are mostly unaware that we have nuclear power plants along the California coast (there were even plans to build a nuclear plant directly on the San Andreas fault at Bodega Bay in the 1960s). We can't make people learn these things, but we've got to try, and we have to give our teachers and educators and media specialists adequate tools to do so. Recession or not, cutting back on education at all levels is a foolish idea. Seers and psychics have always sought to see the future. They have used tea leaves or chicken entrails, and consumed hallucinatory drugs to achieve visions. Earth scientists use seismometers and supercomputers to model future activity along fault zones (and consume lots of coffee). They also make predictions in many other fields, including climatology, hydrology, and volcanology. Our society is living, as I said before, at the very limits of sustainability. We need to know when the quakes will happen. But even more importantly, we need to use the tools at our disposal to understand the changes that are happening in our climate. We need to fully understand the behaviour of ocean currents and cycles. We need to have a clear understanding of how much coal, gas and oil is left, and how the continued use of these fuel sources affects the climate. Recession or not, cutting back on basic research is a foolish idea. POSTSCRIPT: After posting this, it occurred to me that I forget to mention one more atrocity: media coverage. The cable and network news have abrogated their responsibility to produce responsible journalistic coverage in favor of spectacle and high ratings. They long ago let go their science advisors, and their news readers (and that's all they are anymore) have little or no education in the earth sciences. They have very little knowledge or expertise in geology, seismology, or climatology, and they continually make the same factual mistakes every time there is a new earthquake or other natural disaster. FOX, MSNBC, and CNN: your science coverage is an embarrassment to journalism. First off, I am sorry for the quality of the photographs. 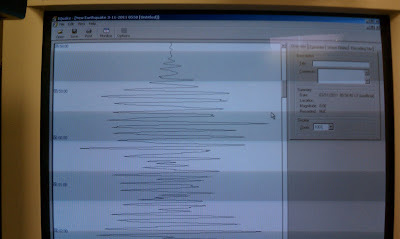 We have a seismometer, yes, but it is a simple teaching model, and the computer program is something like 15 years old (and has never been updated), so the system barely works at all. But it was working well enough to record the shaking of the ground in Modesto, California for several hours after the 8.9 magnitude earthquake in Sendai, Japan. The quake, if the 8.9 magnitude estimate remains unchanged, is the 5th largest ever recorded (I'm hearing that it might be upgraded to 9.0 or 9.1). 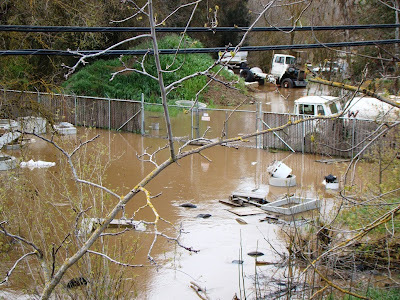 It has killed hundreds and unleashed a horrific tsunami that has spread across the Pacific Ocean basin, causing damage even in Crescent City and Santa Cruz, California. 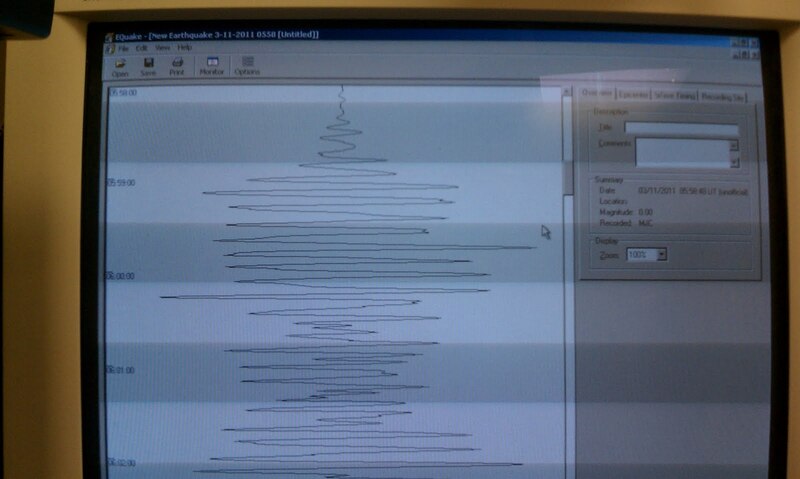 The simple pendulum-based seismometer records ground motions in my geology laboratory on the campus of Modesto Junior College. The first photo (above) shows the onset of the waves from the quake. Earthquakes produce a series of different waves which move in different ways, and at different velocities. The first waves arrived in Modesto at 9:58 PM local time, about 12 minutes after the quake began shaking about 80 miles offshore of Sendai, Japan (that is if the computer clock is right, not a safe assumption actually). These are Primary Waves, compressional waves that are analogous to sound waves. Obviously they travel faster than the other waves. They are an example of body waves, those which travel through the earth, not just on the surface. The second set of waves that would have arrived were Secondary Waves, a slower set of body waves that are generated by shearing motions. The closest analogy I can think of is a whipping motion, like that of shaking a stretched "slinky" up and down (this is the demonstration I use in classes). 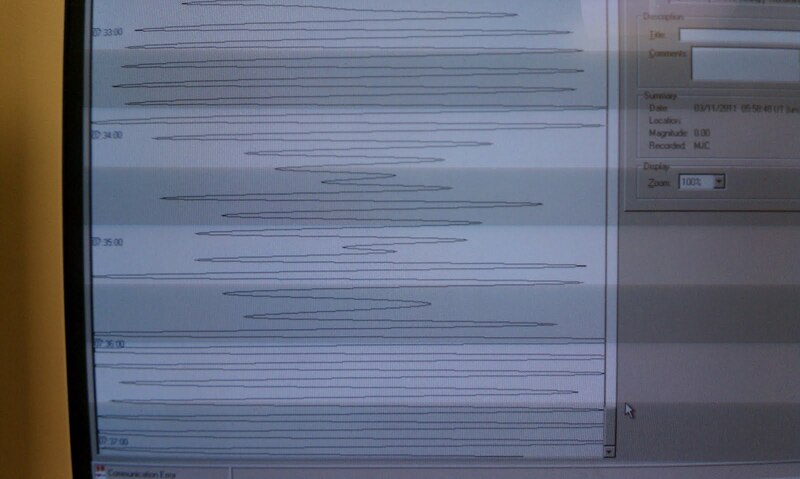 The record on the seismograph doesn't allow me to pinpoint the S-wave arrival. A third group of waves arrive several minutes later. These are surface waves, and as their name suggests, they don't pass through the earth, they travel at the surface. One type of surface wave is analogous to ripples on a pond after a pebble has been tossed in. The surface of the water rises and falls, but fish in the water do not bob up and down. They are unaffected by the passage of the ripples. A second form of surface wave shakes side to side rather than up and down. Surface waves have a lot to do with the damage caused by earthquakes, given the way that energy is concentrated at the surface, and the distortions of the ground caused by the waves. 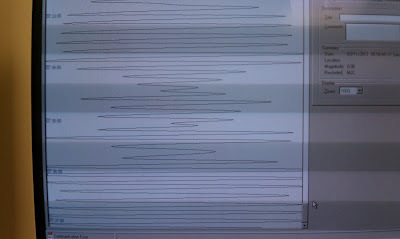 Surface waves continued to be recorded at Modesto Junior College for hours after the quake (as well as reflecting and refracting body waves). 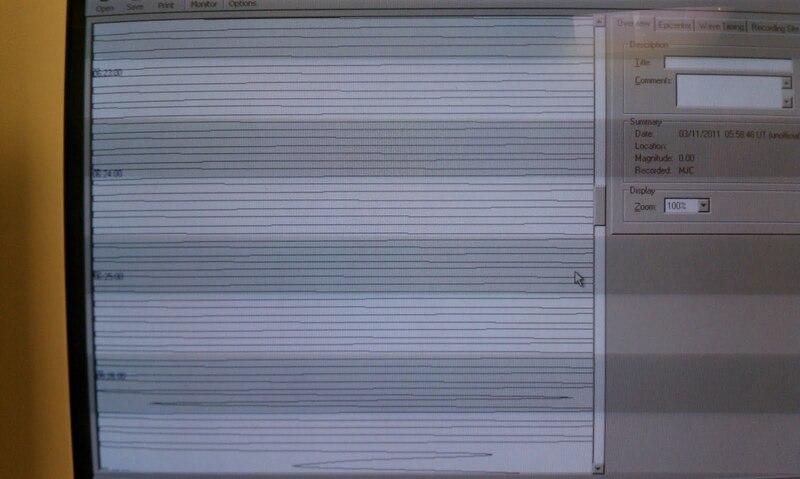 In the picture above, 26 minutes had elapsed, and the monitor was off the scale for minutes at a time. The seismometer is automatically set to record a two hour time period after being tripped, and at the end of two hours, the waves were still immense (above). They probably continued for three or four hours. It's important to realize that the earthquake didn't last this long. From what I've read, the shaking went on for around three minutes at Sendai, Japan (and that was more than enough to cause terrible damage). If the peal of a bell is an earthquake, the waves being recorded at Modesto are the reverberations of the bell. They waves travel back and forth around the planet for many, many hours. The refraction and reflection of these many waves provide seismologists with a picture of the Earth's interior. A note about the magnitude scale: it is open-ended scale that originally measured the size of the biggest wave to determine if a quake was big, medium or small. It is not a 1-10 scale as is often stated in the media, although rocks can only store enough seismic energy to produce about a magnitude 9.5 event. A giant asteroid impact could produce a much larger event, well beyond a ten. The media often report that a rise of one magnitude represents a quake that is 10 times larger, but this is not exactly accurate. For smaller quakes, the increase of 10 times represents a 10-fold increase in the size of the waves. The waves of quakes at around magnitude 6.5 don't get higher, though, so the magnitude scale loses meaning. Quakes obviously get bigger, though. The total energy of a quake increases by a factor of just over 30 times per magnitude number. Thus, a magnitude 7.0 like the one that devastated Haiti last year was 1/30th the size of a magnitude 8 quake, and roughly 1/1,000th the size of the Sendai quake. The horrible death toll of the Haiti quake (despite the smaller energy release) was the result of many other factors, such as the shallow nature of the quake, and the location of the focus directly underneath an urban area. The Sendai quake was 80 miles offshore of Japan. Postscript: Silver Fox at Looking for Detachment has a list of the geoblogosphere's response to the Japan earthquake here. Update: Both the USGS and Japanese geologists have upgraded the magnitude of the quake to 9.0, making it the 4th largest ever recorded. We are learning more about a massive quake in Japan, with an estimated magnitude of 8.9 offshore of Sendai, Honshu. A major tsunami has been generated and the cable news shows are showing aerial shots of an extraordinary wave spreading across agricultural fields, overwhelming roads and villages. From the maps, it appears that the quake was generated in the subduction zone on the Pacific side. There is a good chance that a tsunami could be spreading through the Pacific, but I have not heard any confirmation. I would only say that if the authorities issue a warning, take it seriously and get to a safe place. The most stunning aspect so far has been the aerial perspective of the tsunami spreading across the landscape. The 2004 tsunami in Indonesia was documented better than any previous event, but I don't recall seeing any aerial shots like this. Tsunamis are not really waves, they are surges of water that rush inland at speeds sometimes approaching 100 mph. The surge picks up debris and uses it as a battering ram. It is terrifying to see. The TV commentators are starting to get up to speed, but for the best information from seismologists, check out the U.S. Geological Survey here. They have links to the current tsunami conditions in the Pacific basin. I pray for those in the path of the devastation. UPDATE #1: A tsunami watch has been issued for the Hawaiian Islands. If a wave has been generated, it will arrive about 3 am Hawaii time. UPDATE #2: The tsunami watch has been upgraded to a tsunami warning in Hawaii. Please take it seriously. The waves, if any, will reach the coast of California and Oregon around 7-7:30 am local time. At that distance, I don't expect much, but things can change overnight. UPDATE #3: If 8.9 magnitude becomes official, this is the 5th largest quake in the world since 1900. Chile 1960, 9.5; Alaska 1964, 9.2; Sumatra 2004, 9.1; Kamchatka, Russia, 1952, 9.0. I finally hear an MSNBC commentator get the energy numbers right: the difference in energy between this and the Haiti quake at 7.0 is closer to 1,000 times, not 100 times. 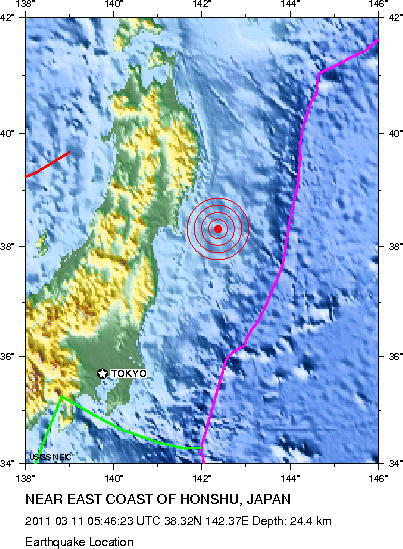 The equivalent of 1,000 Haiti quakes just hit offshore of Japan. UPDATE #4: A tsunami watch has been announced for the coast of California. Take it seriously if you live in coastal areas. If it comes, it will arrive around 7:30-7:45 am in the morning. Listen for official warnings and obey them! Don't do the California thing and wander down to the beach to look for it. UPDATE #5: The Pacific Coast is now under a tsunami warning, with expected wave heights of 3 feet or so, arriving around 8 in the morning depending on location. Take it seriously; if you are on the beach, you could easily be swept away by such waves. Follow official warnings; emergency personnel know what they are doing! 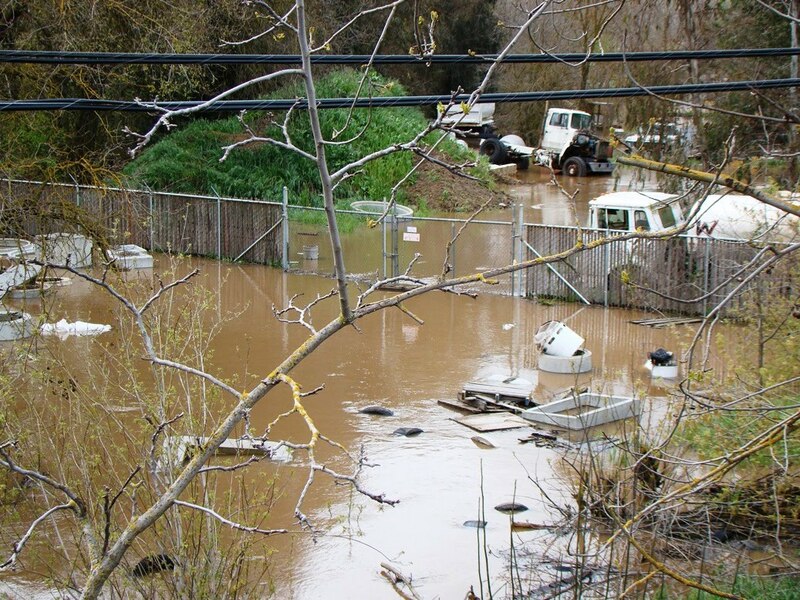 UPDATE #6: Some damage is now being reported in California as surges of water hit Crescent City and other coastal towns. Damage is "significant", not major, mostly along the lines of boats being jostled and ripped from moorings. I'm hearing of waves 5-6 feet high along parts of the California coast, and of 8 foot waves in Hawaii. 11 people were killed at Crescent City in 1964 from a tsunami of 12 feet, in part because they didn't realize the waves come in groups, and the first wave is not necessarily the largest. It is a cautionary tale for all the people rushing out to the beach to "see the tsunami". It might not be a good idea to become, literally, part of the story. Stay out of coastal areas until an "all clear" signal is given. UPDATE #7: Silver Fox at Looking for Detachment has a list of the geoblogosphere's response to the Japan earthquake here. UPDATE #8: Both the USGS and Japanese geologists have upgraded the magnitude of the quake to 9.0, making it the 4th largest ever recorded. Momma, I want to be a Paleomagnetologist when I grow up! How many of you woke up one day and told yourself "when I grow up, I want to be a paleomagnetologist"? It's a question I ask my classes as we start to talk about continental drift and plate tectonics, and it's usually good for a chuckle (sometimes even two), and not once has anyone raised their hand in an affirmative response. It's a relatively obscure field in geophysics, and although most geologists know what paleomagnetologists do, most of the rest of us do not. What follows in the class is a rather extended discussion about Earth's magnetic field and the behaviour of compasses. We're trying to get to a comprehension level to where we can talk about one of the more stunning discoveries ever made in the field of the geological sciences, a line of reasoning and research that provided unexpected evidence for continental "drift" and plate tectonics. It had to do with the Earth's magnetic field. 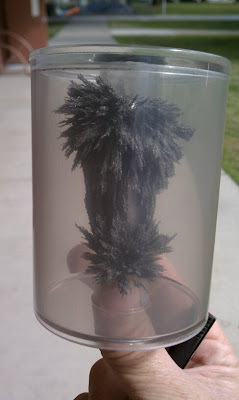 Every child has probably played with magnets, dragging them through the soil picking up iron filings, or playing with the Wooly Willy face drawing toy. Later on, some kids encounter the use of compasses by orienteering while hiking with the scouts or other outdoor groups. For many it stops there, but the exploration of the mysteries of magnetism throughout history is quite an interesting affair, and I was unaware of much of the story. So it was that when I was given a review copy and asked to comment on a new book by Gillian Turner, North Pole, South Pole, I was intrigued, and agreed to check it out. In short, I found the book to be well-written, well-illustrated, and quite interesting. I actually read two books in the last few weeks, and on the face of it they couldn't be more different, but I noticed an interesting parallel. Besides Turner's book, I read an online version of "The Last Ringbearer" by Kirill Yeskov, a Russian paleontologist (! ), a re-telling of the "Lord of the Rings" saga from the point of view of the residents of Mordor. It was a fascinating thought exercise that explores the idea that winners get to write the history, and that Mordor's "evilness" was more a construct of the elve's and men's prejudices than of reality. I recognized the need for a different point of view of history as I read Turner's book. By concentrating on the study of magnetism throughout history, she provides a whole new perspective of the sequence of events that led to the discoveries of "apparent" polar wandering and paleomagnetic reversals, two of the most important lines of evidence that support plate tectonics theory. Unlike Alfred Wegener, who seemed hell-bent on proving his drift hypothesis, the magnetism people were just following the evidence, trying to understand how the Earth's magnetic field worked, and how it had changed throughout time. When they stumbled onto one of the most critical pieces of evidence for the movement of continents (and ocean floors), it was a happy accident, but they were quick to recognize the importance of their findings, even if others outside the field were not. For instance, the polar wander curves for different continents, an unambiguous record of independent continental movements, were worked out in the 1950's, a full decade before the acceptance of plate tectonic theory by most geologists. I'm not suggesting that the paleomagnetologist's contributions to the debate over continental drift have been ignored, it's just that their methods and findings can be a bit harder to explain or appreciate. That is the value of Gillian Turner's book. She has provided a concise and interesting history of the study of magnetism, and a fascinating new perspective of one of the most important geological discoveries of the twentieth century, plate tectonics. It's well worth a look! Turner, Gilliam, 2010, North Pole, South Pole: The Epic Quest to Solve the Great Mystery of Earth's Magnetism, The Experiment Publishing, New York, 272 pages. The Accretionary Wedge for early March is sponsored by Ann's Musings on Geology and Other Things, and we are asked for our favorite geological picture. What a hard choice! I got into geology in part because of the wonderful journey of imagination that it is; a geologist is a world traveler, and a time traveler. 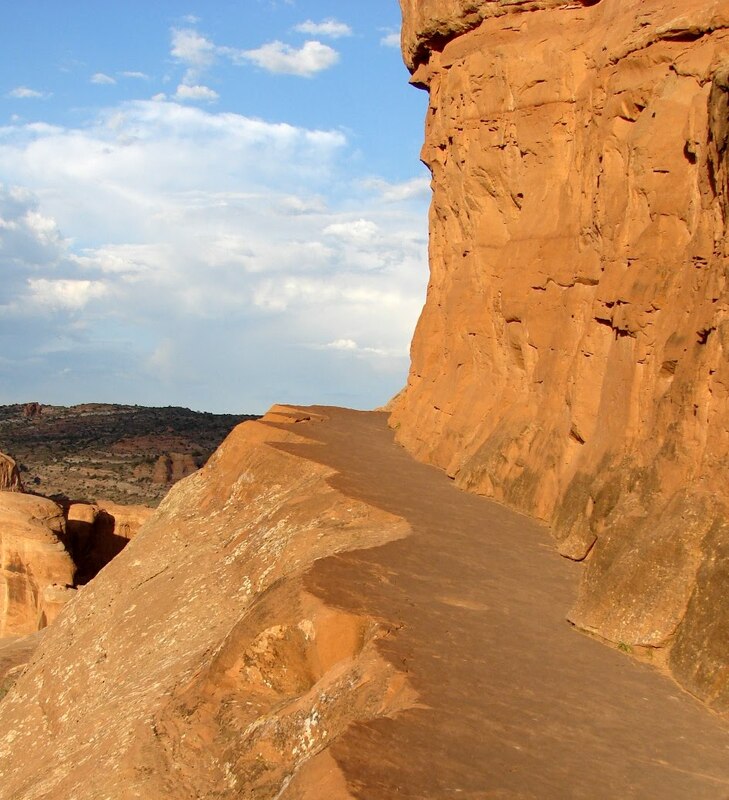 The trail in this picture is formed on a natural break in the rock. Why is the break there? 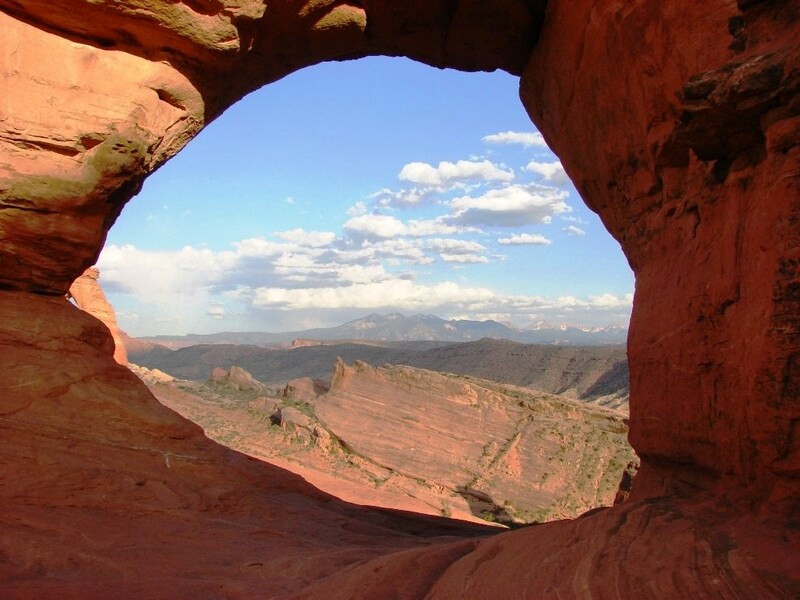 In Jurassic time 180 and 140 million years ago, tidal flats and coastal sand dunes spread across this part of Utah. The surfaces of the dunes were pathways for all kinds of creatures, from insects to giant lumbering dinosaurs. The walked and crawled on these sands, and later the surfaces were preserved by subsequent layers of windblown sand. The surface later hardened a bit more than the others, and millions of years later, erosion exposed the old sands. A fracture developed along the surface, and the trail-builders of a few decades ago found it a great deal easier to just remove the overlying rock than to carve a new flat surface at great expense. And so it is that during our brief sojourn on the planet, we walk on the same surface, and perceive the significance of that fact. We use our minds to explore strange alien worlds, and yet these are the worlds that existed before ours and which became the raw materials for our own. Thanks to Ann for sponsoring the Wedge! UPDATE 8/19/11: Do you need geology-themed photos and images for teaching or research purposes? I have hundreds of geologic images posted at Geotripper Images. Check it out!